Columbia Police Department (CPD) investigators continue to work with Albany, New York investigators regarding the arrest of a teenager who was wanted in connection with a Waverly Street murder investigation. 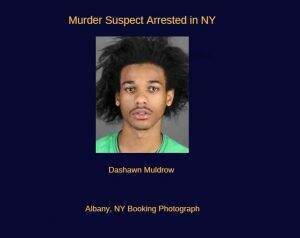 At approximately 7:00 a.m . today, 17-year-old Dashawn Muldrow (DOB: June 2001) turned himself in to the Albany Police Center Station located at 536 Western Avenue. Muldrow will be housed at the Albany County Corrections Facility in Upstate New York on a CPD Fugitive from Justice arrest warrant. Muldrow also faces burglary charges in Albany. CPD Investigators are making arrangements with the United States Marshals Service regarding the extradition process to bring Muldrow to Columbia to face charges. Once he returns to South Carolina, Muldrow will be charged with Murder, Attempted Murder, Attempted Armed Robbery, Possession of a Weapon during the Commission of a Violent Crime, Possession of a Handgun by Person under the Age of 18, Unlawful Carrying of a Pistol, and Criminal Conspiracy. CPD Investigators believe that Muldrow and two co-defendants, 45-year-old Dominic McDaniel and 39-year-old Casey Hairston conspired to break into the victims’ home located at 2210 Waverly Street (Waverly Place Apartments) on October 5, 2018 to commit an armed robbery. As a result, the female victim who has been identified by the Richland County Coroner as Cherelle Evans was shot in the upper body. Medical personnel pronounced her deceased at a local hospital on October 13, 2018. During a struggle, her male acquaintance was hit in the head with a firearm and soon escaped the residence moments before the shooting occurred. At this time, CPD Investigators believe the crime was a targeted act of violence; with at least one of the suspects being acquainted with a victim in the case. Suspect McDaniel is charged with Murder, Attempted Murder, Attempted Armed Robbery, Burglary – First Degree, Criminal Conspiracy and Possession of a Weapon during the Commission of a Violent Crime. CPD Investigators including one assigned to the United States Marshals Service (USM) Fugitive Task Force recently drove to Richmond, Virginia to extradite McDaniel. Suspect Hairston is charged with Murder, Attempted Murder, Armed Robbery, First Degree Burglary and Criminal Conspiracy. 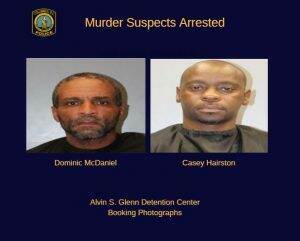 Both suspects are housed at the Alvin S. Glenn Detention Center (ASGDC).